Butterflies are not only pretty and fun to watch, but they play an important role in pollination for flower gardens. Many species of butterflies are declining due to the depletion of their habitat. You can help the butterfly population and make your garden more beautiful by making your backyard a butterfly paradise. Butterflies prefer to feed in sunny places, so choose plants that love full sun. 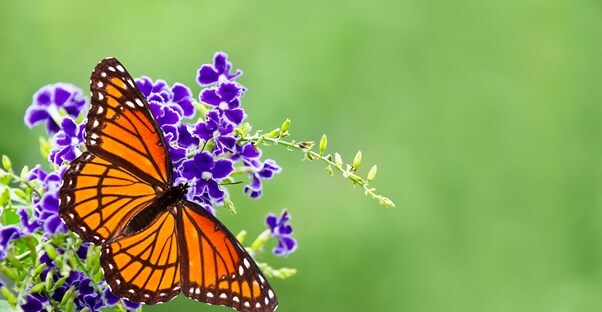 Butterflies are usually attracted to bright, warm colored flowers, so you are going to have more luck with red, purple, yellow, orange, and pink blossomed flowers. Butterflies don't have a long beak like hummingbirds do, so try to choose flowers with shorter flower tubes to allow the butterflies easier access to the flower nectar. There are many different variations of butterfly feeders, but if you want to make your own you can do this with a terra cotta pot tray and dish scrubbers. Make a mixture of four parts water to one part sugar, fill the tray, and place the scrubbers inside. The scrubbers will soak up the sugar water and give the butterflies a dry resting place to land while they slurp up the sweet nectar. Milkweed is an easy-to-grow, no nonsense wildflower that can provide a safe habitat for Monarchs. The adults lay their eggs on the leaves, and when the eggs hatch the caterpillars eat the milkweed leaves. Milkweed grows best in full sunlight, so make sure you choose a sunny spot for your new plant. You may have seen a group of butterflies assembling around puddles on sunny days. Butterflies primarily eat flower nectar, but they also need water and minerals to reproduce. They get these nutrients by gathering around mud puddles to drink water rich in salt and minerals. You can make your butterfly puddler for your garden by filling a birdbath with sand and soil and wetting the soil until it is just moist, leaving small puddles here and there. Be sure not to over water the soil or butterflies will steer clear since they are unable to land on water. You can also add small rocks or objects to offer the creatures something to rest on while they feed. Butterflies are fragile creatures and they need places to rest and hide. By planting shrubs, hedges, and small bushes around your garden you will provide these delicate creatures with much needed shelter during overly hot days or thunderstorms or from predators. You can also place large stones around your garden to give butterflies a place to sit and warm their wings during the day.